Whoever said that East is East (think Broadway) and West is West (think the vibrant West Coast theatre scene) and the twain that would never meet was dead wrong! The twain, did indeed, meet arriving in the form of a triumphant production of the musical “CHESS” produced by CVRep on its brand spanking new 2 Million-dollar, state of the art theatre in Cathedral City on March 15, 2019. CVRep Artistic Director Ron Celona’s dream of bringing quality, Equity, professional live theatre productions to the greater Palm Springs area became a reality last Friday with a star-studded audience of actors, producers, sponsors, and donors plus a loyal cadre patrons of CVRep attending the grand opening. The champagne flowed before the performance and flowed again at the after-party accompanied by platters of shrimp and a variety of tasty, scrumptious canapes (with nary a calorie in any of the food, yeah, sure). It was a glorious evening several years in the making, but the result is a stunning Broadway-like venue of comfortable 208 seats to please even the fussiest of theatre-goers. CVRep’s Artistic Director Ron Celona, who also directs the maiden voyage production in CVRep’s permanent new home, was over-the-moon, with the standing ovations received from the audience that is richly deserved. “CHESS,” is a musical written by three giants of the Broadway stage: librettist Richard Nelson, lyricist Tim Rice, and a musical score composed by two members of the world-famous Swedish pop music group ABBA: Bjorn Ulvaeus and Benny Andersson. The story is set in 1968 during the European ‘cold war’ period in Bangkok, Thailand and in Budapest, Hungary. The United States and the Soviet Union are still engaging in bragging rights in the game of diplomacy and politics. However, tensions exist, and it’s still a dangerous time period for both sides, and anyone caught in the middle. 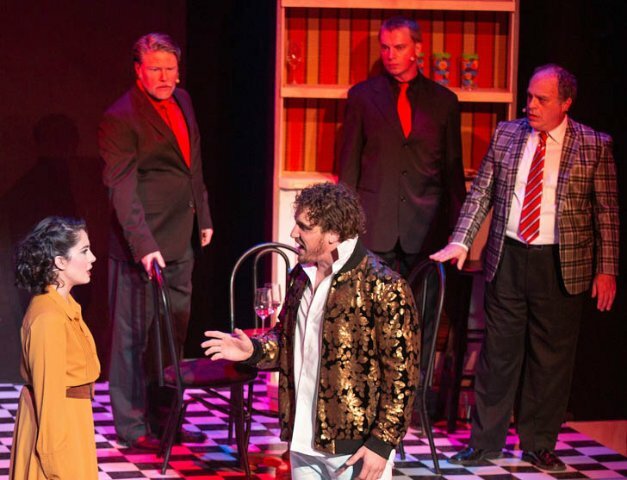 The musical is loosely based on the 1972 world chess match between American Bobby Fisher and Russian Boris Spassky, held in Iceland. Librettist Nelson spices up his fictional chess match between Freddie, the American challenger (Intentionally and cockily played by Garrett Marshall) and Anatoly, the reigning world champion Grand Master from Russia (David Sattler, a wonderful rich baritone who can act). As the two men meet to lay down the rules for the match with match arbiter/referee Jeremy Whatley. Anatoly catches the eye of Freddie’s agent Florence (a beautiful Gabriella Carrillo, and the possessor of a lovely voice). Sparks fly, as they say, between Anatoly and Florence, and had Shakespeare been the author of this beautiful musical the audience would be watching “Romeo and Juliet.” But the lyrics of Tim Rice and the music of Ulvaeus and Andersson more than make-up for the absence of the Bard in this enjoyable production. The performers in “CHESS” are multi-talented and deliver strong support. Michael Dotson as Molokov, the KBG agent in charge and acting as a faux tour guide/interpreter, is especially effective, as is Glenn Rosenbaum as Walter, a U.S. diplomat trying to keep all of the Americans focused on why they are in Bangkok and Budapest on this world chess match good relations tour. Tensions rise when Anatoly’s wife Svetlana (a statuesque Ashley Hunt) arrives in Budapest, and the love triangle of Anatoly, Florence, and Svetlana have decisions to make. There are many twists and turns in the production that predicting the outcome may not be as easy as one would think. Come see it for yourself; it’s a crowd-pleaser. There are 28 songs and dance numbers in the production’s ensemble unit that deliver solid support to the principles and the supporting cast. I found the song standouts to be a dance number with Freddie and the ensemble in a number entitled “One Night in Bangkok,” and “Terrace Duet,” that is nicely sung and rendered by Ms. Carrillo and Mr. Sattler. Also “I know Him So Well” is poignantly sung by Ms. Carrillo and Ms. Hunt, and I pondered at the time how many in the audience that number resonated with. The ensemble deserves recognition for their efforts in this highly professional company that includes: Sydney Clemenson, Briana Maloney, Cassidy McCarron, Michael Rawls, Roman Skryabin and the show’s Russian Dialect coach, and Daniel Sugimoto complete the ensemble unit. The creative team led by director Ron Celona, features the talents of Musical Director Scott Storr; Choreographer Michael Nickerson-Rossi; Set Designer and Emmy award winner Jimmy Cuomo; Lighting Designer, Moira Wilke Whitaker; Associate Designer Doug Morris; Stage Manager Louise Ross; Costume Designer Aalsa Lee; Sound Designer Kate Fechtig; Lynda Shaeps, Hair and Wig Designer, and Joshua Adams technician/running crew, complete the creative team. This splendid production of “CHESS,” made CVRep’s first production in its new home an auspicious and triumphant opening night to remember. For reservations and ticket information call CVRep at 760-296-2966. And remember, A great nation deserves great art. Support the Arts! Courtesy of Desert Local News.